Gender equity laws and limited funding together confine SF State’s athletic program, leaving the school without a men’s track and field team. These constraints have fragmented who can participate in the school’s sports teams, inhibiting potential athletes from competing. Many students often wonder why SF State only has certain teams, but in addition to scarce athletic funding, balancing the number of athletic teams for men and women due to Title IX, which sets standards for gender equality in sports, is part of the reason. This stems from a lawsuit the California State University system settled with a women’s group over the inclusion of women in school sports, making compliance with the act more explicit. The lawsuit stated that the ratio of male to female athletes should be reflective of the student population’s gender ratio. In 1993, the CSU system settled a lawsuit with the California National Organization for Women, which alleged that 19 schools were failing to comply with Title IX. The two parties ultimately settled on a consent decree that specified how the schools must comply, stating that athletic enrollment and expenditures must reflect the student body. “It’s not necessarily stricter, but it’s more specific. The number of athletes has to be close to the makeup of the school,” said Athletic Director Michael Simpson. Men’s track and field was among the sports cut at SF State in 2004, when the athletic department was forced to eliminate five sports because of financing issues and the sport was chosen to balance the male to female sport correlation. Besides men’s track and field, the school also dropped men’s and women’s swimming, women’s tennis and women’s volleyball. Volleyball was ultimately brought back in order to help the department’s gender ratio. Title IX was passed in 1972 and aims to eliminate gender inequality in collegiate athletics. The act provided a three-prong test for compliance. The first prong deals with proportionality, the second focuses on progress toward proportionality or equality and the final examines student responses demonstrating interest and opportunity in collegiate sports. 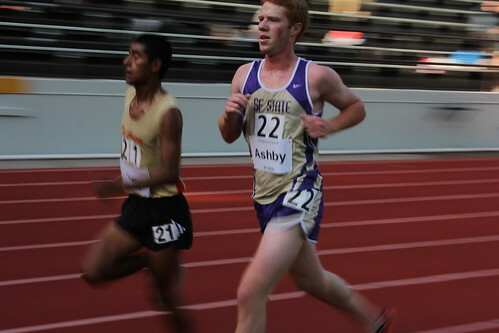 The absence of men’s track and field has prevented junior Alex Yonas from participating in athletics at SF State. After starring in track in high school, competing primarily in the 3,000-meter steeplechase, Yonas initially attended the University of San Francisco, but left after his father suffered a heart attack, and ended up transferring to Merritt College, a community college. Many of his teammates were in the same situation and devoted a large portion of their time to competing and preparing for their events because they could only afford to go to college if they received scholarships. Continued funding woes have prevented the school from adding sports, as they receive the majority of their funding from a $68 fee students pay into their tuition costs, $58 of which goes to the athletic department, and the other $10 to recreation. “We’re very dependent on enrollment; the more students we have the better we are,” Burke explained. In the 2010-11 athletic year, the school gave out $341,000 in scholarships to its 296 athletes. Some student athletes don’t receive any scholarship money, while others receive up to $2,500. “We have the lowest resources in terms of scholarships and other areas in the conference. It is really tough with the cost of SF State and the limited funding,” Burke said. Chico State University spent $644,000 on scholarships for 375 athletes, which is an average of $1,706, nearly $600 higher than SF State. Its total athletic costs were $4.7 million, 20 percent higher than SF State’s $3.9 million. “You look at schools like Chico State and (UC) San Diego, who have more funding than ever, and it’s reflected in their results,” Burke said. Yonas has suffered a few injuries since leaving USF, but said he would still like to run track, though SF State is not planning to add the sport any time soon. I am glad there is no men’s track team at SFSU. More important to the university is upholding gender equality through Title IX compliance. By eliminating opportunities for men, gender balance is achieved – the right thing to do. I am proud of the university’s feminist stance on this issue!